Assured Automation: We Make Automation Easy!! These high pressure coaxial valves feature compact design, fast acting actuation and high cycle life. It is capable of pressures up to 600 psi, available in 2 or 3 way designs with brass or SS wetted parts. 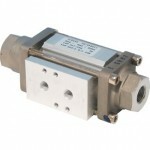 It is available in pneumatic or electric actuation. Feedback switches are also available. The demo in this video shows how the electrically actuated valve works, the red coil is energized creating a magnetic force which opens the valve, when the valve is de-energized the valve closes. The next demos shows how the pneumatic operation works. Air is supplied to one side of the piston opening the valve, once air pressure is released the spring returns the valve back to closed position. Configure your VAX online using Assured Automation’s online configurator. The valve configurator allows you to easily view available options, get pricing,purchase online or save the information to a file. Assured Automation your source for automated valves and flow meters! This entry was posted in Latest News, New Product Announcements and tagged High Pressure Coaxial Valves, VAX Series. Bookmark the permalink.